Sins of the Father is a non stop adventure novel following two detectives as they hunt down a dangerous drug kingpin who seeks revenge. What was the inspiration to the setup to this exciting novel? This is actually the third installment in the Larkin and Colt series. 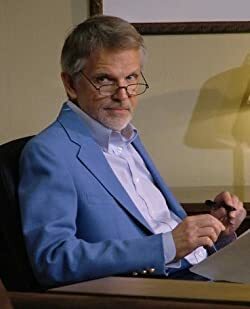 As I was preparing to write the first book I established, just for myself, extensive backstories for the main characters, including their years as undercover ‘contractors’ for the government. Among the stories I created was the takedown of a notorious and supposedly untouchable drug kingpin. After I finished my second book, I found myself wondering what the possible long-term repercussions might be of some of Larkin and Colt’s past actions. The opening scene of a gang of assassins breaking into Larkin’s house popped into my head almost fully formed. From there, it was pretty much off to the races. My favorite character was DEA Agent Scott Bowman, whose dry humor kept me smiling throughout. What themes did you want to capture while developing your characters? I wanted to create a character who was dedicated to his job and trying to do the right thing, but who had been doing it for so long that he knows that achieving any kind of long-term solution is pretty much impossible. He’s a realist, and he knows that he’s pretty much rolling a rock up a hill, but he still refuses to give up hope. When he’s approached by Larkin, he sees a chance to maybe do a little bit of good, despite his knowledge that the good guys don’t always win, and the bad guys are incredibly hard to stop. 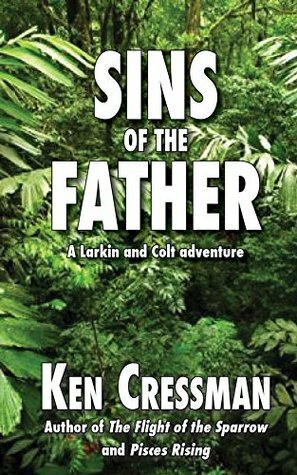 Sins of the Father is a genre-crossing novel with elements of a adventure, thriller, and action as well. Did you start writing with this in mind, or did this happen organically as you were writing? I try to write the story I’d want to read. I don’t outline, but I pretty much have the whole plot worked out in my mind before I start. I have the major story points, but not necessarily all the fine details. I sort of let the characters tell me what happens next and where they want to go, as long as we’re always moving toward the outcome I have in mind. I try to let the story and the characters’ actions flow naturally, at the same time hoping to surprise the reader. I’m currently working on a sequel to my science fiction adventure Pegasus, which is not a Larkin and Colt book. It’s entitled Intrepid, and where Pegasus was about a trip to the moon and back, this time they’re going to Mars. When they arrive, things go horribly wrong, and the crew has to figure out how to get their crippled ship back home before their air and food run out. It’s sort of Apollo 13 meets The Martian. It should be out sometime in the fall. So begins the latest exciting episode in the adventures of David Larkin and his partner Samantha Colt. Eight years ago, Larkin and Colt were part of a team that terminated notorious drug kingpin Francisco Salazar. Now Salazar’s son Ramon has grown up, taken over the family business and sworn his revenge upon them. Their only option is to follow the trail of drugs and bodies backwards, from Virginia to Miami to South America, to stop young Ramon before they become his latest victims. Sins of the Father is loaded with the exciting action, wry humor and memorable characters that fans of Larkin and Colt have come to expect. A page turner from start to finish, Sins of the Father is a captivating adventure that kept me wonderfully entertained. Almost a decade ago, notorious drug kingpin Francisco Salazar was taken down by a crack unit. His empire fell, and for years remained in ruin. Now his son, Ramon, is grown and ready to take on his father’s mantle. This is where we join David and Samantha, a pair directly involved in the elimination of Salazar Sr., as they undergo a mission spanning several countries, with the task of bringing down Ramon and destroying the Salazar empire for good. I appreciate a book that can capture my attention. With this book, Ken Cressman is able to do just that. The very first chapter brings you into the fray as you struggle through a home invasion, and from there the action ramps up. The world is filled with vibrant and unique characters, from the main duo: David Larkin and Samantha Colt, to the variety of interesting supports, I never once found myself wanting for more. My personal favourite was a DEA Agent named Scott Bowman, whose dry humour kept me smiling throughout even the darkest of scenes. There was a sense of real, tangible rapport between each of the characters that sucked me in, with realistic, intelligent dialogue. That being said, I would sometimes find that the characters never strayed too far from their stereotype. The cocky DEA agent, the classic Colombian kingpin, it could all feel a little too generic at times. Now, this isn’t necessarily a problem, (I mean, who doesn’t love slick detectives? ), but straying away from the herd wouldn’t be such a bad idea. Each character was well developed, but it all seemed to happen behind the scenes instead of right in front of me. I was being told who a character was instead of being shown. As an avid reader, I need something that can keep me entertained. That’s something that Cressman has complete success with. The story takes Larkin and Colt through a variety of settings, from the thriving city of Miami to the lush jungles of Colombia. Every time I found myself settling down, becoming too comfortable, there will be a sudden shift in dynamics and the scenery will take a drastic shift. Cressman’s attention to detail brings each location to life, and it felt like I was alongside these characters every step of the way, whether it be bundled in the trunk of a car, or sneaking through the halls of a cargo ship. The pacing of the plot is rhythmic, with perfectly timed twists and turns, culminating in a satisfying conclusion that will leave you eager for more. Ken Cressman has crafted an intense adventure story that is consistently entertaining.